Fire mitigation and means of fire suppression are gradually becoming important and required considerations for commercial industries, hospitals, construction sites, and even rural homeowners, in addition to the possibility of receiving tax incentives for implementing fire suppression tanks. Many individuals find themselves in remote areas where access to municipal water is in short supply and as a result its necessary to acquire a bulk water storage tank to stay in compliance, save on insurance rates, and control liability in regards to safety, the environment, and decrease the risk of financial liability as a result of a fire or emergency situation. Risk of fire is not the only reason to acquire a water holding tank, as there are numerous regions within the United States that encourage the water storage for landscape irrigation to decrease the strain on existing infrastructure and to promote more environmentally sustainable practices. While there are less stringent requirements for urban and rural use in residential applications, most commercial and industrial water storage solutions often require compliance with NFPA, NSF International, or AWWA guidelines. This is usually dependent on the type of business, size of buildings, and on location. It is recommended that businesses in urban and rural areas take every precaution necessary to uphold local, state, and federal fire codes that pertain to their industry. Furthermore, new residential communities and commercial developments often have a lack of municipal water supply and choose bulk water storage options such as steel water tanks to meet the demand as well as meet LEED requirements for green construction. Corrugated Steel Tanks uphold these considerations, as they meet the strictest requirements by the NFPA (National Fire Protection Association) - NFPA Code No. 22. As a result, our corrugated steel water tanks meet NFPA Code No. 1142 and 1231, as well. Our corrugated tanks are highly rated for industrial, agricultural, and commercial applications and feature dual use capabilities for both fire suppression and residential water applications. And, while water for firefighting is not required to be safe for consumption, our corrugated tanks are safe for potable water storage as a result of AWWA and NSF/ANSI.STD 61 compliant coatings used to prevent corrosion. Smaller scale applications for residential homeowners in rural or urban environments typically use Poly Water Tanks for their bulk water storage needs. These usually satisfy local fire codes, are less of an investment, and feature a simple set-up compared to larger corrugated tanks. Fiberglass Tanks are an excellent water storage option for commercial properties, agricultural facilities or businesses in need of backup water supply. 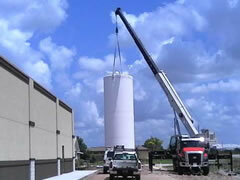 Fiberglass water tanks meet AWWA and NFPA 22 requirements for private fire protection. 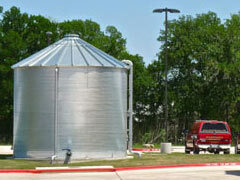 Welded Steel Tanks designed for fire protection, have long life spans and are securely set in place. Welded steel fire protection tanks comply with NFPA 22 fire codes for industrial, commercial and institutional buildings. Flexible Pillow Tanks are made in sizes up 210,000 gallons for bulk water storage. Capable of hooking up to sprinkler systems for easy fire water supply, these collapsible tanks can be made NFPA 22 compliant. In both instances of commercial and residential use, there are tax incentives and the potential for decreased insurance rates, dependent on location and local law. Coupled with having a back-up water supply for fire fighters and an onsite fire protection system with potential for automatic sprinklers and on-demand fire suppression, owning a bulk water storage solution is an ideal investment for any application. Do you have any questions? Contact your local fire marshal for your areas requirements or give us a call at 1-772-646-0597 to find out more about our water storage solutions!